Ada pertanyaan untuk GT Seaside Inn? 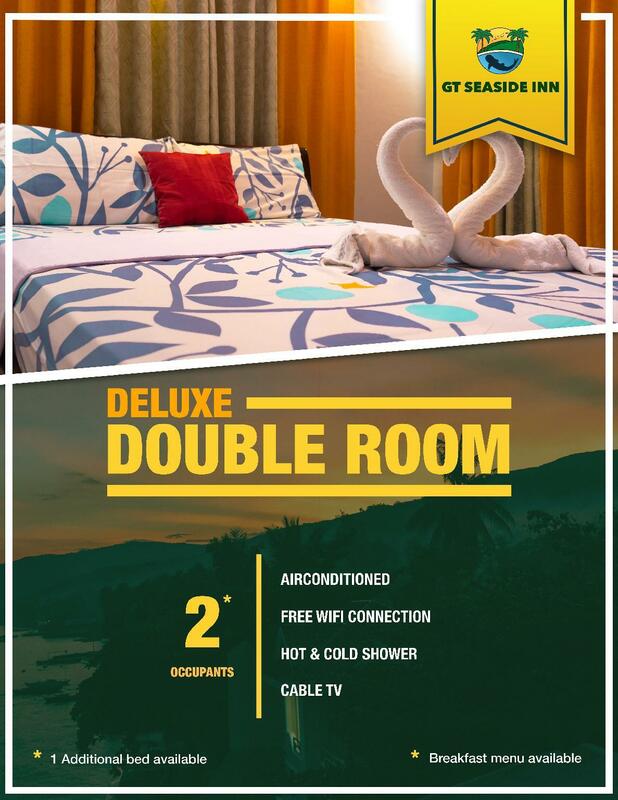 Bagi para wisatawan yang ingin menjelajahi kota Cebu, GT Seaside Inn adalah pilihan yang sempurna. Dengan lokasinya yang hanya 117.8 km dari pusat kota dan 129.9 km dari bandara, hotel bintang 1.5 ini menarik perhatian banyak wisatawan setiap tahun. Dengan lokasinya yang strategis, hotel ini menawarkan akses mudah ke destinasi yang wajib dikunjungi di kota ini. Fasilitas dan pelayanan yang ditawarkan oleh GT Seaside Inn menjaminkan pengalaman menginap yang menyenangkan bagi para tamu. 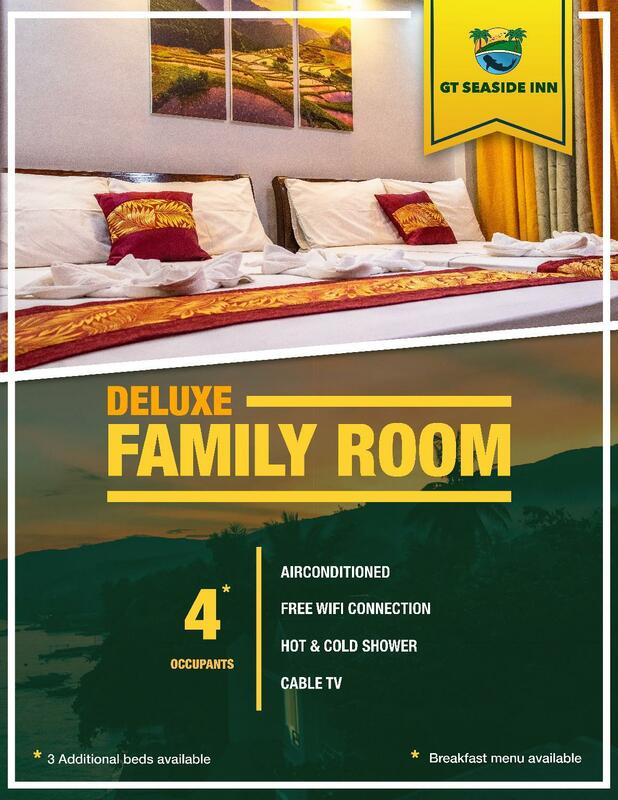 WiFi gratis di semua kamar, layanan taksi, resepsionis 24 jam, check-in/check-out cepat, Wi-fi di tempat umum hanyalah beberapa dari fasilitas yang membedakan GT Seaside Inn dengan hotel-hotel lain di kota ini. Hotel ini memiliki 7 kamar yang didesain dengan indah. 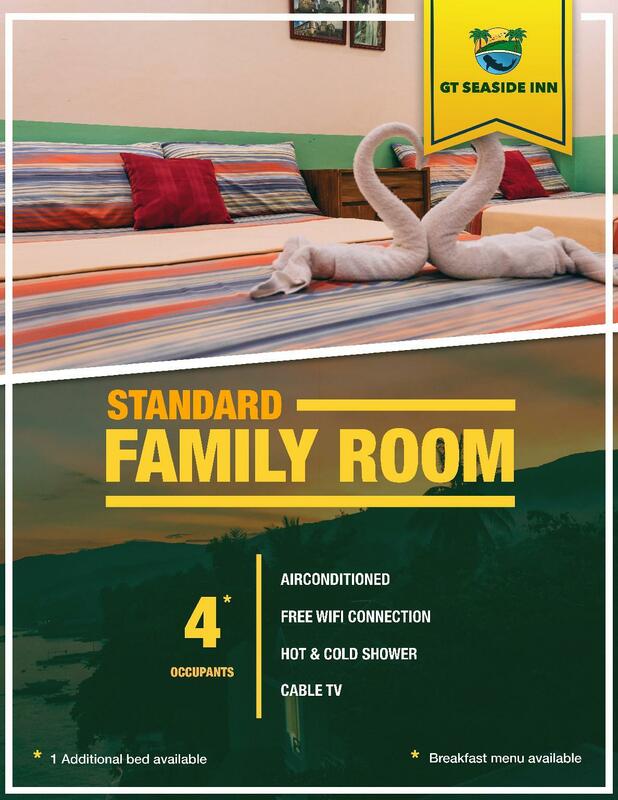 Banyak kamar memiliki handuk, rak pakaian, televisi layar datar, akses internet WiFi (gratis), kamar bebas asap rokok. Baik Anda yang menyenangi kebugaran atau hanya ingin bersantai setelah beraktivitas sepanjang hari, Anda akan dihibur dengan fasilitas rekreasi kelas atas seperti pantai pribadi, memancing, pijat. Temukan paduan menarik dari pelayanan profesional dan sejumlah fasilitas di GT Seaside Inn. We had two rooms. The one on top was newer, clean and spacious. Very nice and very comfortable! The one across from it on the bottom floor was extremely small, dingy and uncomfortable. Terrible drainage in bathroom. After a shower, the entire bathroom floor fills with water and leaks into the room. It was bad. You are awoken early by the sounds of the kitchen staff. Make sure to request an upper unit! However.. The staff were very friendly and accommodating. The views are peaceful and pretty. The breakfast was good. We arrived here late in our first nigbt and Arthur was waiting for us. Great host and very helpful. Booked us for whale sharks first thing following morning, came back for breakfast and then a trip to Kawasan falls. Only 10 mins from whale sharks. Lovely breakfast. Clean room and modern. Nice place and locals in the village very friendly..
Great location, relaxing, walk to shops, cafes and 2 min walk to pick up coach. Staff arranged our Whale Shark trip with no drama. Accomodation is neat, clean and friendly. One of the most relaxing stays anywhere. Thanks to the staff. Staffs there are so accommodating. Help us to buy the tickets of whale shark. The driver is also a nice guide. It is so cheap to drive us to the port of sumilon island, then sent us to the boarding place to panglao island. And the bungalow is just beside the beach, where you can easily to see sunrise. Sir Arthur is very kind and helpful. They arrange tours for you in a reasonable price (actually cheaper and convenient than looking for a tour agency). The rest of the staff are courteous. We stayed here in 2017, and stayed here again this year. It's a calm and next to the ocean. The place is also walking distance from cultural attractions, convenience store, and night food market. Very accommodating staff. Arthur was very helpful. The rooms are a bit smaller but they were very clean. We had a family get together and they were at different hotels - we had all the cleanest by far at GT. Breakfast was also yummy. Very clean and very friendly staffs. This is the cleanest accommodation we stayed in Cebu out of 3 places. Although there is no luxury here, the inn has the local vibe. The location is also next to the beach and within the walking distant to the town. 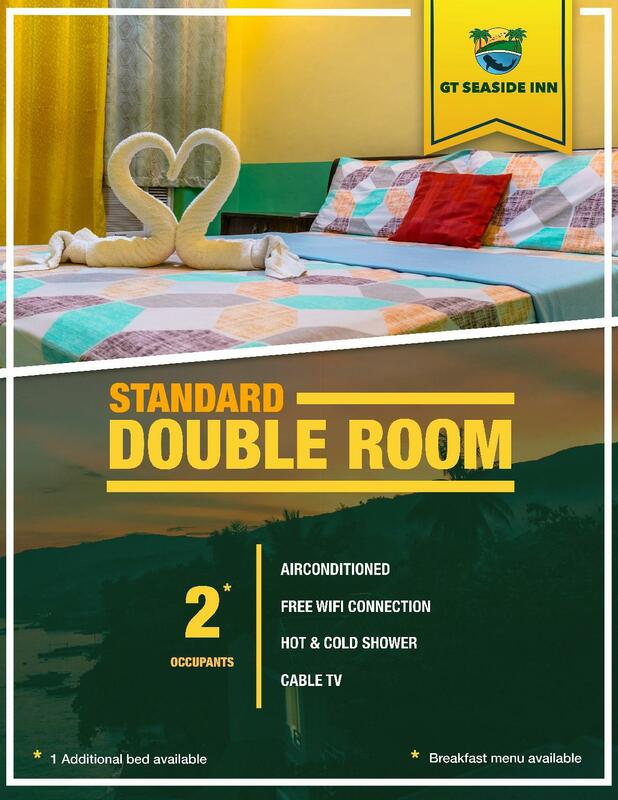 This place combines the convenience of being in OSLOB town with good amenities easide, breakfast included , motorcycle rental available , all at a great price. they even help with teh whale watching if needed.. It was a pleasure staying at GT Seaside Oslob. The Staff is excellent with personal touch. We had a unique experience when my daughter found a shell from Sumilon Island and then we cooked the conch, took it out and struggled to get it out from the shell :). Owner is an awesome guy who in-fact arranged drop off to the bus stand of Oslob. It's near to Shark Spot and Tumalog Waterfall. Awsome location. Its in the heart of Oslob city which is very convinent especially traveling with Kids. 7-11 departmental store also very near. Over all an exceptional stay and yes will visit again. Very nice place to stay. Location is within the town, walking distance to their Church, Baluarte & 10mins away to Whale Shark watching. This place is so great with an amazing view because of its seaside location though their beach is not too nice for swimming esp for kids but you can relax & hear the sound of sea breeze esp during at night. The rooms are okey, beds are comfy, toilet is clean. Arthur the caretaker is so nice as well.. Overall highly recommeded to everyone. We will definitely come back here next time. Oslob is worth a stop-over rather than a day trip to see the whale sharks (you need to be there 06:00 to avoid the crowds) and this is a delightful place to stay to do it. Great quiet location but v near the small town. No beach but neither had anywhere else. Clean and tidy with v helpful staff. I stayed 2 nights as they were able to arrange a squid fishing trip for me (P2000). Would recommend. Stayed for 2 nights. The place is so nice! It is also near the main road and is easy to locate. They have a very accommodating staff as well. What we liked the most is that they organize tours for such an affordable price and also the transportation. We had our Canyoneering and Whale Shark Experience organized by them. All our tour guides are very nice, explaining and assisting us in the entire duration of our tours. Highly recommended if you want hassle free tours and a very homey accommodation. Kudos! We only had one night in oslob, and were more than happy with our choice to stay at GT Seaside In. 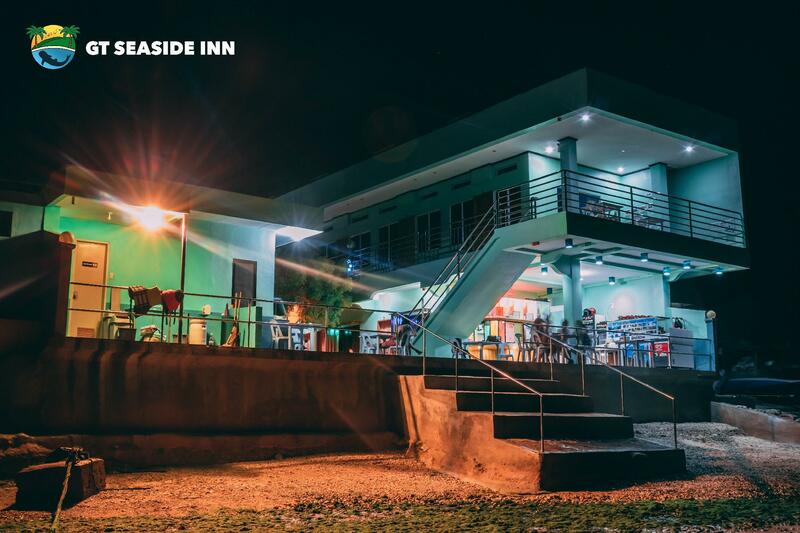 The hotel is perfect, on the ocean front, walking distance to town, close to all activities oslob has to offer. Our stay was made even better by the service provided by the hotel manager Arthur a very genuine guy. He helped with all our needs especially the whale sharks providing transport and a go pro camera all at a correct and genuine price. I highly recommend this hotel. After many many years travelling in the Philippines I have rarely felt more at home and comfortable, because of the hospitality and service provided by Arthur and the staff. GT Seaside is an adoable little place in Cebu. You can walk in to town easily, there is a great restaurant down the street and the owners go out of their way to assist. We did the whale shark snorkelling and the owners were instrumental in getting us to the location and past all the tourists etc. They are expanding to offer even more facilities (ie an on site restaurant). Be advised to take cash as they were not set up at the time for credit but overall an awesome location. Staffs are very accommodating & provide assistance for your daily activities. It's a hassle free vacation like everything is in place. The resort has good ambience & very relaxing ambience. Will stay here again & would recommend the place highly. We went here last week as a couple. When we entered the room, we were amazed. It was a small room built for couples but it was clean and in order. AC is good, although there was a black out during the entire afternoon, it didnt make our stay disappointing. Staffs were friendly and they usually gather during siesta time around the balcony singing songs using guitars. It may have been the best stay if we offered breakfast. We asked for it eventhough it was indicated on our booking that breakfast is included. It could have been better if they initiated it before we asked. :) Hotel is near the city proper. No resto available near the area but you can find it near market and there were food stalls or ihawihaw which offers a wide variety or food. :) Overall, our stay was amazing!